Whole Foods Market (WFM: $37/share) dropped 4% on Thursday morning after reporting disappointing sales growth, the most recent hit in a rough 2014 for the stock. Slowing growth, margin concerns, and increased competition have helped send shares down 35% so far this year. What most investors do not know is that Whole Foods is not as profitable as people think. Digging through the footnotes in WFM’s filings, we saw that their accounting earnings consistently overstated their economic earnings. For example, we found over $4 billion (110% of reported net assets) in off-balance sheet debt. Off-balance sheet debt allows companies to obscure the true amount of capital invested in their business, artificially increasing ROE and return on invested capital (ROIC). While other sites around that time were reporting that WFM earned an ROIC above 10%, we recognized its ROIC was actually in the mid-single digits. Investors who don’t read the footnotes don’t get the full picture. The profitability of the company has actually improved since my 2010 article. ROIC is up from 6% in 2010 to 8% last year. The bigger problem has been that the expectations reflected in its share price remain much too high. As is too often the case with stocks, no matter how good (or bad) the business, the valuation implies future cash flow growth that the company is highly unlikely to achieve. Stocks with such high expectations tend to be ticking time bombs. It is hard to know when they will crash or which straw (such as a minor stumble on EPS) will break the camel’s back, but when they do crash, they crash hard. WFM remains significantly overvalued despite the recent decline. After my 2010 article, momentum drove the stock up enough that, even with this year’s decline, WFM has still outperformed the S&P 500. However, the worst of the carnage may not be done. Though it has dropped far enough for it to earn my Neutral rating, WFM is still not a cheap stock by any of my measures. At its current valuation of ~$38/share, WFM has a price to economic book value (PEBV) ratio of 2.9, a good bit higher than the S&P 500 (2.5). More specifically, to justify the current price the company has to grow after-tax cash flow by 12% compounded annually for 18 years. It’s hard to believe that Whole Foods, a mature company in a competitive industry, can grow profits at such a high rate for such a long time. For comparison, Kroger’s (KR) NOPAT growth over the past decade has only been 4%. The message here is that overvalued, high growth stocks might work out… for a time. Investors who bought into WFM in 2010 have done pretty well. Investors who bought in 2011 or later are probably hurting. Momentum can drive a stock up far beyond the value of its cash flows, but eventually gravity takes hold. 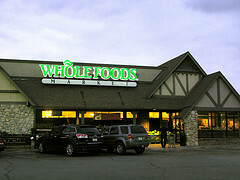 We saw it with Angie’s List (ANGI), LinkedIn (LNKD), Zynga (ZNGA) and now WFM. Chasing highflying stocks might lead to short-term profits, but it carries the risk of long-term pain. Sam McBride contributed to this report. Disclosure: David Trainer is short ANGI and LNKD David Trainer and Sam McBride receive no compensation to write about any specific stock, sector, or theme.